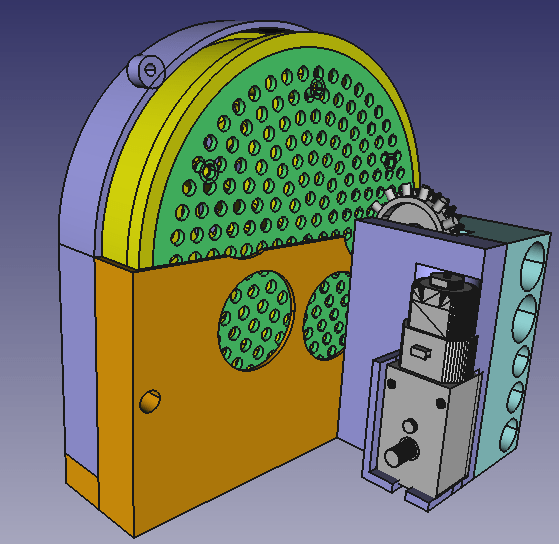 I tried setting this up so that the drum could be rolled from an elastic band or cog against the edge of the drum, but it turned out there was a simpler way – the little air-holes in the drum are an equal distance apart, so I designed and printed a gearbox that could turn the drum using those holes. It sacrifices a little bit of surface area for the cold side of the drum, but I don’t think it will make a huge difference. I made a few 1mm errors in the gear box prototypes, but when I corrected them, it worked as soon as I applied power to the motor. The motor I’m using in this case is one of the standard yellow geared motors (like this). I’m still waiting for the heating element to arrive, but have a few fans I can use to get started on the airflow. I don’t even know what size the heating element I ordered is, so can’t design that side yet, but I can design the cold side while I wait. I’ll get started on that tonight. The 3D printer I’m using is an Anet A8, and I have to say that it’s a dream to work with compared to my old Makibox 3D printer. I was amazed when I printed out the drum and enclosure for this project and they fit perfectly. With the Makibox, the circles would have been flattened and I’d have to sand away any bits that rub, but this one is just perfect. Even the gearbox would have been impossible to print on the Makibox. The Anet A8 is so good that when some of my students were asking me for a bill of materials to make a 3D printer, I told them that even though it would be possible to spend €120 or so and make a 3D printer from scratch, they’re better off spending $150 and buying one of these ones instead.